One of the benefits of presenting interactional data is that it is inherently fascinating. My research is in medical settings and presenting my work to clinicians is almost easy – people love the opportunity to have a bird’s eye view of how they and their colleagues perform their daily tasks. When presenting at a clinical conference I can rely on the data to be the star of the show. So how to approach ICCA, where every presenter has equally engaging data? At a conference where conversation analysis is the core focus, the subtle (or not so subtle) differences in how we analyse and present come into focus. Over the 5 days in Loughborough, I found myself in many conversations on how ‘best’ to present – how much data should we show? Is it OK to present analysis in its early stages? To handout, or not to handout? People argued the merits of presenting meticulous, detailed analytic work vs the merits of presenting one or two simple, clear ideas. The benefits of reading one’s presentation, ensuring succinct descriptions and that nothing you want to say is missed, vs the benefits of not using notes and speaking openly and naturally to your audience. What I learnt from ICCA is that variety is what makes research fun. Just compare the first two plenaries – with Jeffrey Robinson’s rigorous and compelling combination of detailed CA and quantitative methods to examine preferences, compared to Rebecca Clift’s insightful observations of eye rolls and open palm gestures basically just showing us ‘look how cool these are’. Both presentations were two of my favourites of the conference, despite their very different styles. So, how did I approach presenting when it came to my turn? The hard work had been done before I got there, and so I’m lucky to say it all went by in a bit of a dream. (A nice, cool dream, as the Accounting for Intersubjectivity panel were the only ones with air conditioning for the whole of Saturday!) I went for handouts, probably marginally too much data, and not reading from notes as reading makes me nervous. With the help of a warm and engaged panel chair in the form of Tom Koole, a fantastic talk just preceding mine from Virginia Teas Gill, and some friendly but challenging questions from the audience I had a very enjoyable presenting experience. Here’s to Brisbane 2022! Since their development, EM and CA have contributed enormously to various debates on legal and police practices. 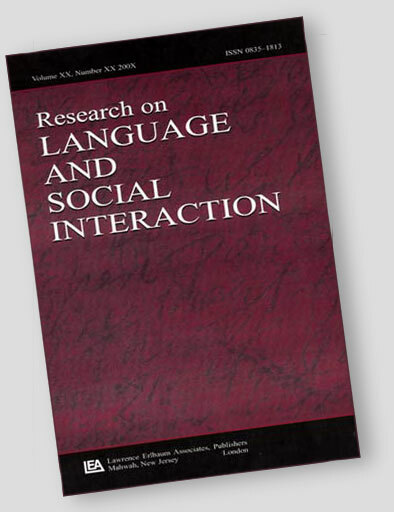 They have done so by, amongst other things, respecifying the connection between law-in-action and law-in-books; describing and examining how professionals and lay people perform their actions and interact in legal and police settings – the ‘missing what’ of socio-legal studies and sociology of law; showing the fundamental character of language and talk-in-interaction to understand judicial and quasi-legal proceedings; and better understanding how legal work is conducted through question-answer exchanges, and more specifically how police, lawyers and other legal professionals employ ‘questioning’ in the construction of a legal case. Following this research tradition, I recently organised a panel at the ICCA held at Loughborough University. The panel sought to bring together researchers from around the world whose interdisciplinary contributions are focused on different judicial and police settings and whose methodological approaches are mainly EM and/or CA. The panel consisted of two sessions, each with four presentations. The first speaker was Marcia Del Corona (UNISINOS, Brazil), who presented her research on emergency calls in Brazil. She showed that since caller and call-taker orient to their own membership categories when describing places, a great amount of time is spent in attempting to achieve intersubjectivity regarding the location to which the police must be dispatched.. The next presentation was given by Mardi Kidwell (UNH, US). Based on video-recordings of police traffic stops in the US, she examined how officers describe a reason to stop and how citizens display, or fail to display, alignment with that reason. Her study showed how the work of securing citizen alignment in the early stages of such encounters is essential to securing alignment in later task stages, including the outcome (i.e. whether citizens will receive a warning or a citation). The third presentation was given by me. Based on my analysis of audio-recorded UK police interviews, I discussed the multiple activities accomplished by officers when they (re)formulate what the suspects have previously stated in the interaction. In particular, I showed that these (re)formulations are employed to transform the suspects’ lay narratives and accounts into legal material, to convey the sense that what has been said is coming from the suspect’s mouth, to highlight admissions and denials, and to put these admissions and denials on record. The last paper in the morning session was presented by Guusje Jol (Radboud University, Netherlands). Based on her analysis of Dutch police data, she discussed an interactional dilemma faced by police officers when interviewing children who have allegedly been sexually abused: how they can display their affiliation with the children’s narratives without compromising their professional neutrality. After a morning session discussing police work, the panel resumed in the afternoon with a focus on the judicial arena. The first to present in this session was Lucas Seuren (University of Groningen, Netherlands). Using video-recordings of jury trials from US state courts, he investigated the interactional properties of direct examinations. He showed that instead of being requests for information, questions in direct examinations are in fact requests for action, i.e. to inform and persuade the jury and the judge. The next speaker was Martha Komter (NSCR, Netherlands), who talked about the role of the case file in interactions in a Dutch courtroom. She started by showing that judges have a dual task in court: to ratify the evidence by reading aloud or summarising items from the case file, and to question the defendant in order to find ‘the truth’. She then examined the multitude of dis/encouraging features of judges’ references to the case file and the suspects’ responses to them, concluding that opposing forces may be at work to both encourage and discourage responses from the suspects. The third presenter of the afternoon was Christian Licoppe (Telecom ParisTech, France), who discussed the interactional difficulties in video-mediated multilingual (with an interpreter) hearings at the French appeal court for asylum demands. For example, he showed how the interpreter’s ability to enable the asylum seeker to produce expansive answers and story-telling is diminished when they are interacting from remote locations. Was this man a criminal? In the final slot of the day, Louise White (Loughborough University, UK) moved to a more general discussion about the discursive construction of innocence across different settings. To do so, she examined how suspected criminals respond to accusations in police interviews, television interviews and vlogs. By analysing data from legal and non-legal settings, she was able to identify how discursive actions are organised to exploit or be constrained by the affordances and contingencies of these settings (e.g. the audience, the status of the speakers, the potential consequences, and the purpose of the interaction). In summary, the papers in this panel explicated a multitude of actions, activities, and practices employed by professionals and lay people. They did so across several institutional contexts in which language and legality play an important role, including emergency calls, traffic stops, police interviews with suspects and victims, and courtroom hearings and examinations. By looking at materials from the different stages of various legal systems, the panel produced a more detailed understanding of police and judicial settings and showed how the array of practices that constitute law-in-action are deeply interconnected.